Discipline, fitness and skills for young adults. 12-16 year olds only. Suitable for all levels, especially beginners. Total Boxer Youth classes are our world-famous Get FIT Not HIT® boxing fitness and skills sessions designed specifically for 12-16 year olds. 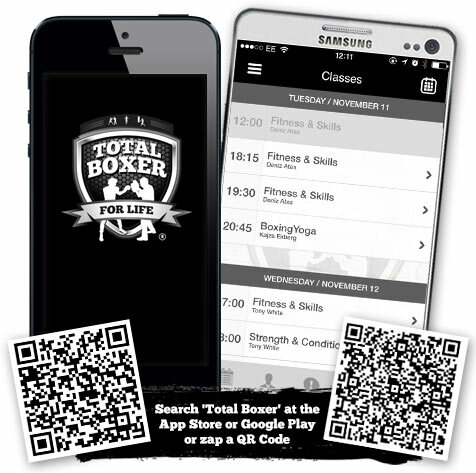 All the classes we offer at Total Boxer are conducted in a positive and fun environment and Total Boxer Youth is no exception. It’s where young adults can experience the discipline and enjoyment of boxing training while learning strong core values that will stay with them forever. Boxing is considered an effective way of helping take violence off the streets, giving young adults an outlet and helping them focus. Check out the The Guardian article, ‘Boxing is the best way to stop violence in kids’ for an interesting view on the subject. Total Boxer Youth classes are highly effective at establishing positive training habits that promotes mental focus, weight loss, increase in fitness, building of confidence and skills in self-defence. Through guided rope-work, shadow boxing, pad-work, bag-work, boxer-style circuit training and plenty of encouragement and support, Total Boxer Youth will help improve mental state and physical shape while learning the true craft of a fantastic, fun and challenging sport. Classes are demanding but fun, friendly, and open to everyone between the ages of 12 to 16 especially absolute beginners, whatever the level of fitness. All students will need boxing hand wraps and gloves for the class. It’s no problem if you don’t have your own, you are welcome to borrow them from us on the day, free of charge. If you’d like to buy your own, Total Boxer boxing gear is top quality, looks great and is available to buy online, ready for collection on arrival.al. We have created Total Boxer Youth Membership and training prices especially for the Youth 12-16 year old sessions. For more information visit the prices page, here.